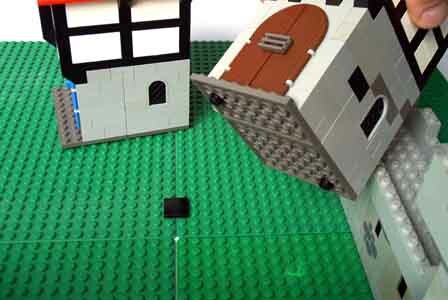 -This standard was created at Brickfest 2003 by the Castle Roundtable Discussion chaired by Ben Medinets. 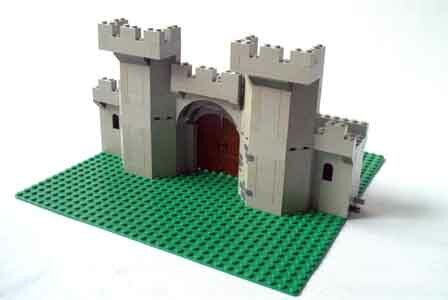 This standard is meant to provide an easy way for various people to work together to build a large cohesive castle display. Since this concept is specifically designed for displaying purposes, many elements (such as the need for a coordinator) are included. Please do not let this limit creativity. At Brickfest, we found the central problem in designing a castle standard has been the streets. Castle villages were not cohesively designed until the late medieval ages, and therefore a grid like design would seem anachronistic. At BrickFest 2003, we came up with the solution. This will be illuminated as you read below. Another key issue in developing this Standard was to walk the line between larger, more detailed creations ( such as Dan Siskind’s Blacksmith Shop ), and keeping the standard simple enough so that any person with a moderate collection could contribute. Furthermore, this Standard does not conflict with earlier standards, such as the Medieval Marketplace. The Basic grid of the standard is the 32 x 32 green baseplate (from here on out, it will be called the 32 baseplate). Wall sections will be built directly onto the 32 baseplate and will be able to attach to other wall segments. The interior of these walled areas will be filled in with blank 32 baseplates. The Wall segments are of two basic designs: straight and corner. 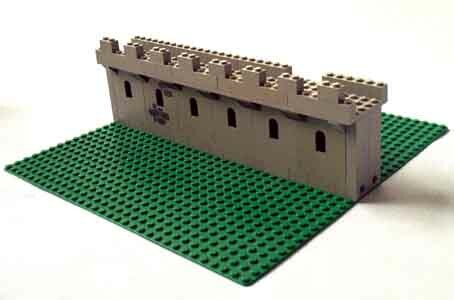 They are a total of 8 and 1/3 bricks tall and 4 studs wide, hollow; and it runs down the center of the 32 baseplate. You may notice that this is based off the modular Classic Castle, such as the Guarded Inn, Black Falcon’s Fortress, and King’s Castle. We decided to make the walls 4 wide (the top area being 6 studs wide) to be more accurate in the design, while still keeping with the versatility and universality of the Standard. The Corner pieces serve as towers. The Wall segments attach to eachother with two technic bricks at the ends of the wall. Now the key to this standard is that these wall segments are only the most basic form they can take. Don’t feel like using wall pieces? Fine, build a brick wall. Want to build barding, or an Inn or shop that is imbedded into the wall? Even building a non-straight wall is fine, as long as it is 8 1/3 tall, and meets at exactly the center four studs of the 32 baseplate. 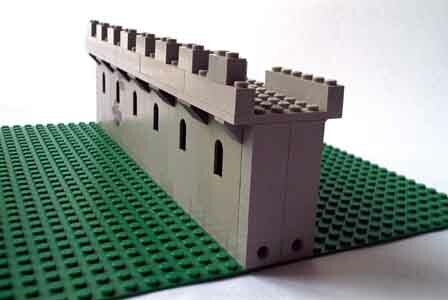 A subsection of the straight walls, is the Gate. Again, this is a very basic design, but highlights my earlier point: At either end of the gate, the walls are 8 1/3 tall, and meet in the center. 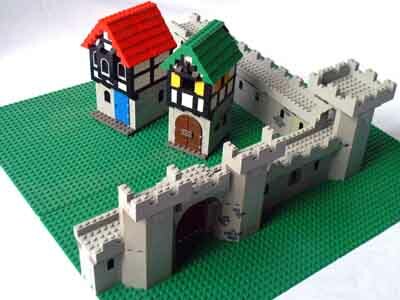 For Displays, a Co-ordinator should be chosen to make sure there are enough wall pieces and corner pieces to complete an entire walled town. So I’ve talked a bit about the walls.. well, what about all the houses and shops that go inside? This is where the Castle Round Table Committee got creative. Based off of Jon Furman’s Provincial Town and Anthony Sava’s Dahyart, the Committee thought up a solution to the grid city problem. Individual houses and shops should be built on plates (as opposed to baseplates). These houses can then be placed liberally within the Wall segments to create the winding roads of a medieval city. The Houses can be of any size and any amount of detail: as long as they are on plates. The houses will be attached using 1x1 round plates. Roads within the city would be formed by 2x2 round grey plates. These form a very nice cobble-stone appearance, and the grey plates are very cheap. In a display, the coordinator would be responsible for bring the required amount of plates, or making sure that they are there (ie, finding someone else to bring them). The great thing about this standard, except it’s amazing versatility and flexibility, is that it still conforms to the early Medieval Marketplace standard. The MM is based off the 16x16 baseplate, which, if you have four of them, transfers nicely into 1 32baseplate within the city walls of the Classic Castle City. As I said before, this standard is beautiful because it is simple yet will produce a realistic, attractive Medieval Town for display. But not only within the town. By having the wall segments be in the middle of the 32 baseplate, that means there are 14 studs outside the walls, which can be used to help add to the display. Troops of Soldiers could be marching around, country vendors could be selling their produce for the richer merchants who can afford to be inside. Furthermore, the standard allows for larger creation, like a keep of large townhouse, as long as it is built on to a 32baseplate. Of course, you may also notice that there is the possibility that different wall segments will have different colors or style. 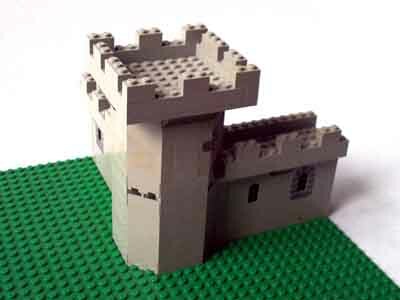 However, medieval city walls were often built over decades, and thus different building materials are used in different sections. Furthermore, parts of the wall may have been damaged during an attack or natural disaster, and so they would be rebuilt with possibly different materials or style.